About Become an Energy Coach! 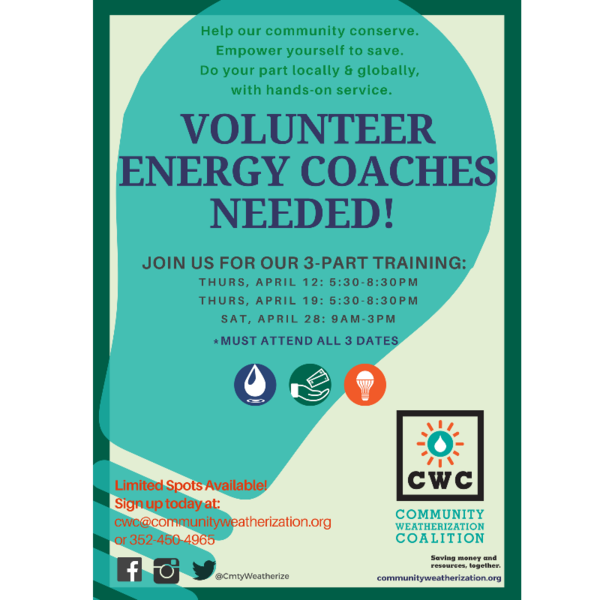 Join our team to learn how to empower yourself to save, help our community conserve, and do your part locally and globally! During our energy coach training sessions, you will learn how to help local, low-income residents save $ on their utility bills by performing home energy tune-ups throughout Alachua County. You'll make hands-on changes to immediately conserve resources in households, as well as offer energy and water-saving tips that the family can follow after the energy tune-up is complete, saving them as much as 20% on their utility bill. Besides becoming an energy coach, we have a variety of other ways to get involved, from outreach and fundraising to helping stock supplies to help these great local families. Email cwc@communityweatherization.org for more info! Log in to see who is volunteering for Become an Energy Coach! !